On Sunday, October 7, Los Angeles will celebrate its fifth CicLAvia, transforming 9.1 miles of normally congested streets into a car-free, linear park for strolling, biking, playing, and experiencing the city from a new perspective. The route for the October 7 CicLAvia offers a veritable grand tour of Los Angeles’ most celebrated attractions, connecting the world-class museums of Exposition Park with the architectural landmarks surrounding the newly completed Grand Park in the city’s civic center, where CicLAvia will converge with the inaugural celebration of the park’s performance lawn. The upcoming CicLAvia comes a week after “Carmageddon II” September 29-30, during which 10 miles of I-405 were closed. Organizers anticipate that more than 100,000 Angelenos will happily leave their cars behind again in order to participate in CicLAvia. The new route offers an unparalleled opportunity to survey Los Angeles’ cultural and culinary riches, including MacArthur Park’s majestic views, downtown’s bustling cafés and pubs, and historic Little Tokyo, with new extensions through the heart of Chinatown and Mariachi Plaza in Boyle Heights. There will also be a wide variety of activities, both planned and spontaneous, for people of all interests and ages, including music, performances, and games. The CicLAvia route includes six hubs, each situated in the heart of a unique neighborhood and accessible by Metro Rail: MacArthur Park; Exposition Park; Grand Park at Civic Center; Central Plaza in Chinatown; and Mariachi Plaza and Soto Station in Boyle Heights. Plan your trip to CicLAvia using Metro here. Please note: Metro is no longer using paper tickets so transit users must purchase a reusable TAP card, which can be purchased at ticket machines at Metro Rail stations and other locations. A TAP card costs $1. Riders have the option of adding single trips to their TAP cards or different types of passes; a day pass is $5 and good for unlimited rides that day. Here’s how to load a pass. CicLAvia is free of charge and open to all. No reservations are required. 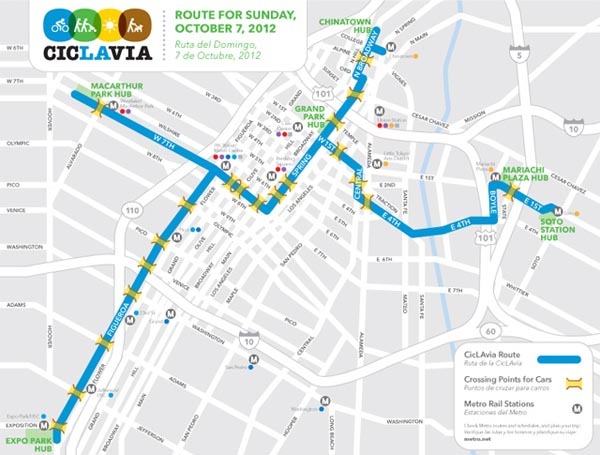 For more information, or to download maps, please visit www.ciclavia.org. To keep up with the latest CicLAvia news, become a fan on Facebook or follow us on Twitter.